This novel told me all I needed to know about how not to vacation in New York City. First, ensure that you pick-up your own bag at the airport. Second, don't accidentally keep anything that isn't yours from that wrong bag and third, well, don't read this book just after your teen daughter returns from a trip to New York City. I was captured by this book by the end of the first short chapter. I barely put it down till I finished it the next day, carrying it around the house with me as I attended to chores. The father, Jeff Griffin, decides to investigate the abduction of his family on his own, which I find a bit far fetched. Not that a father would search for his missing family, but that he would have any idea how to go about that search and that he would have any more success than the police. I was able to suspend my disbelief as the story was quick paced and didn't leave time for pondering, I just had to quickly trail along behind Jeff lest I miss out a detail. I look forward to reading more by Rick Mofina. Rick Mofina is a Canadian born author with more than a dozen titles to his name, both in series and stand-alone. During his thirty year journalism career, he has written his way around the world and covered murders, an armoured car heist and every thing in between. Thanks to Rick Mofina for use of the cover image. There's a new running race coming to Waterloo, Ontario in just four weeks: In Running Colour. It's a brand new fundraiser for Big Brothers Big Sisters. Today, my children got a trial run through of what this race is going to be like. At five stations along the course, the runners will be subject to a cascade of coloured powder (very safe corn starch). by the end of the race, their previously white shirts will be much more interesting. The following video features a short demonstration, though only one colour will be used at each station in the actual race. In Running Colour is an all ages event with 4km or 1km distances for runners and walkers. Would be a terrific outing with your family. August 24, 2013 at Columbia Lake (Brubaker House) on the grounds of the University of Waterloo. Visit the RunWaterloo website for further details and to register. From the same site you can click to sponsor any of the runners. Should you wish to sponsor my daughter, follow this link. A compelling story set in an alternative late 19th century London, England. In this version of history, much of the male aristocracy is infected with a 'craving' virus that makes them yearn for blood. They are not vampires as they still retain some of their human morals, or at least as many morals as these titled gentlemen ever had. Upon the death of her father, Honoria Todd and her siblings have been forced to flee the city for the comparative safety of Whitechapel. She is being sought by Lord Vickers, who has placed a huge bounty on her. He's not the only one searching for her. Blade, the man known as The Devil of Whitechapel has also been keeping his eye on her. He is also afflicted with the craving virus, though he uses his increased strength to help protect those in his neighbourhood. I liked the character of Honoria. During that time period, there were limitations to womens jobs and she has strived to maintain suitable employment for a middle class. Blade is a much more complex character. He has experienced horrors at the hands of the aristocracy, yet he still cares for and protects the people of Whitechapel. Yes, he wants Honoria for his own devious purposes, but he tries so hard not to take unfair advantage of her. In classic steampunk style, steam machines, mechanical devices and other technology play a role in the story , but they don't take over. They continue to play a supporting role that allows for far-fetched feats of strength and firepower to fit into that time. I totally enjoyed this book and the developing relationship between Honoria and Blade. Note, there are detailed sexual scenes in this book, though they are not the main focus. Thanks to Sourcebooks for use of the cover image. The Meet Me at the Cupcake Café Sugary Sweet Spotlight! It is no wonder that the flirty and frothy food-themed novel, Meet Me at the Cupcake Café by Jenny Colgan is an international success: with relatable characters and scrumptious recipes at the start of each chapter, Meet Me at the Cupcake Café is pure delight to women’s fiction readers everywhere. This summer, Colgan is bringing her hilarious and heartfelt stories—with a dash of deliciousness—to the United States! To celebrate, Sourcebooks is giving away copies of this book ALL MONTH LONG! Each day this month, look for opportunities to win a print copy of Meet Me at the Cupcake Café with bloggers all over the book blogging community. Additionally, there will be a few guest blogs and interviews with Jenny sprinkled throughout—a great way to get to know a new author! Follow along all month long for a chance to win a copy of this highly-anticipated and deliciously delightful new novel! What could be better than a wonderful story interspersed with mouth watering recipes. Meet Me at the Cupcake Café is a winner on both these points. Issy Randall grew up in her grandfather's bakery learning to bake from an early age. After she is laid off from her job at a local real estate firm, she decides to open a bakery/café, after all, everyone keeps telling her she is a natural in the kitchen. Things don't go exactly as planned, but that doesn't stop Issy. She keeps trying new recipes and baking more. Along the way, she makes good friends with the women she hired to help run the café and with the banker who arranged her business loan. If only she could get beyond her ex-boyfriend, who was also the boss who fired her, then life would be perfect. Issy is the kind of person that I would include as a personal friend. She cares for her elderly grandfather as well as the welfare of her staff. She has a good grip on what it takes to run a business and turn it into not just a money making venture, but a fixture in the community. I'll admit, that while I was reading this book, I experience severe cupcake cravings. In fact, it was so bad that I resorted to a boxed mix, the white cake with coloured sprinkles. Oh, they were so good, but I'm sure they were nothing compared to the ones that Issy would have made. Included in the book are numerous recipes from Issy's grandfather. Most of them I found very appealing and would enjoy re-creating in my kitchen. Now for the contest to win a copy of Meet Me at the Cupcake Cafe: Leave a comment below telling me your favourite food to bake (a link to the recipe would be appreciated but not required). Be sure that I have a way to contact you should you be chosen as the winner. (Random drawing, open to Canada and USA) For more chances to win, visit the blogs listed above for their contest. Closes August 5, 2013. **if you have difficulty in leaving a comment, send your entry via private email and I'll enter a comment for you. ABOUT THE AUTHOR: Jenny Colgan was a fussy eater as a child and didn’t even begin to learn to cook until she was 21, when her then boyfriend tried to teach her a few basics purely out of exasperation. While she is now able to make a variety of good, wholesome food for her family, she still can’t make scones. A former columnist for The Guardian, Jenny contributes regularly to national BBC radio and is the bestselling author of more than eleven novels, including The Loveliest Chocolate Shop in Paris (coming out in the US in early 2014). She is married with three children and lives in London and France. For more information, please visit http://www.jennycolgan.com/ and follow her on Twitter, @JennyColgan. Thank-you to Sourcebooks for sponsoring this blog tour and contest and for use of various book materials including my ebook copy. All of my split quarter-square triangles look like. In the paper sketch, in the upper right I show the two variations as per the original directions. Note that all my pinwheels spin in the same direction. In the tutorial instructions, you will notice that the pinwheels spin in both directions. More fun working on the wall hanging of my son's painting. I was asked last week if I would be showing a photo of his painting as some point. Yes, after I take one. I'll show them side by side once I finish the quilt. I decided to work on the blue sections first. I am using the pattern called "Pea Gravel Path" by Leah Day. I had three different types of areas to fill: a very narrow strip, several inch wind strips and then several abstract shapes. I played around with the pattern so that it would fit in all of the spaces. This is how it looks stitched in the one inch sections. The narrow band at the bottom is filled with a single row of pebbles. The triangle above it is essentially as shown by Leah. It's not as smooth as I had hoped, but with each section I work on, it is looking better. This area was really puffy before I started to stitch , I wasn't sure how it would go as it rippled when I did the first part of the pattern. Fortunately as I stitched the ovals, it took in all the extra fabric without any creasing. We have been having some very hot weather lately, and it's expected to continue for the next while. Makes for great indoor time and stitching. I'm looking forward to continuing with the blue areas. Do you have a favourite activity when it's too hot to spend time outdoors? Six teens from different backgrounds are on a wilderness experience trip in the Canadian Rockies. They each have their reasons for being there and with their own goals for the trip. On the sixth day, a most unusual set of events occur, which causes their experience guide, Harbin, to make some drastic changes to their route. From this point on, the story took twists and turns which I couldn't have imagined. Each one of them pulled me further into their lives and I found that I couldn't put the book down, I had to keep reading to find out what could possibly happen next. Yes, some fantastical things happened, but they were introduced with such skill that they seemed a natural progression of the story. It was interesting to watch how these adventures forced the teens to work together if they wanted to survive. Working together didn't mean that they amazingly became the best of friends and formed immediate deep and last trust in each other. They still had to work at their relationships, but they learned quickly that you could work with someone even if you weren't entirely sure you could trust them. The events of the last few days of their expedition have a profound impact on the teens and we clearly see that they are changed people as a result. I am looking forward to reading the next book in the series, Afterlife, to see if they were short term changes or if they were more. Thanks to author Eric Kent Edstrom for use of the cover image. note: I read and electronic version, though paper copies are also available. This is a banned books in some areas, so a great choice to read or listen to. I finally found the time to start work on the "Aiming for Accuracy Quilt Along" hosted by Michelle at the Quilting Gallery. 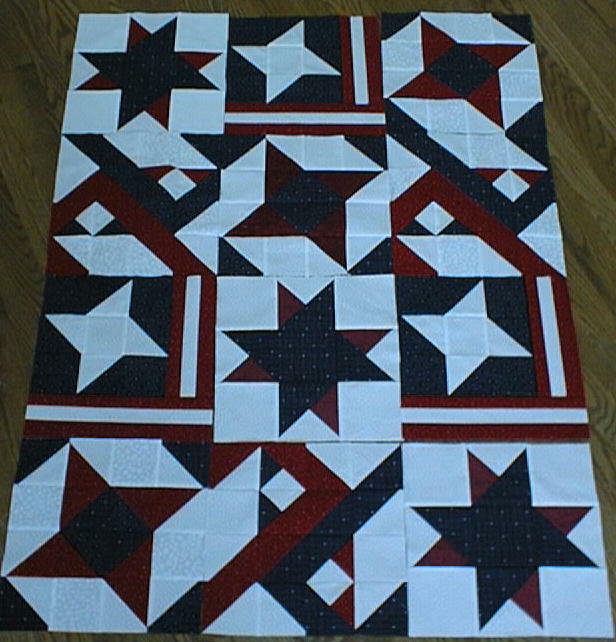 The whole idea of this project is to work on our accuracy in piecing. There are all sorts of hints and tips for improving and Michelle is available via email should your question not be answered in her lessons. As with many of the ladies, I played around with the placement in block one. I'll call these windmill blades. I much prefer them darker as they abut with the brown which I am using as my background. Here's my finished block. Measures a mostly accurate 15 1/2 inches, then add the bit of sashing across the bottom. I have the fabrics selected for block two, yet to cut though. As an incentive to keep up to date, Michelle has prizes each week and they do look good, some fabric, patterns and more yet to be revealed. the first pieced strip for my sister's afghan is complete. it is shown at the bottom of the above photo. It measures 61 inches and it should be 60. I will need to add a couple of repeats to the alternate row shown above . obviously my tension isn't quite right, but I'm OK with that. Just hope I'll have enough yarn. I am going to weight these rows once I've made them the same length and then calculate whether I have enough. If I suspect that I don't, I'll go to the outlet right away (with my fingers crossed) and hope that they still have a ball of this colour in stock. When my son was in high school, he did a painting that looked like stained glass. Somehow during the course of our conversation about the painting, he ended up challenging me to make a quilt that looked like the painting. How could I pass that up. In the matter of a few short weeks, I had the top done and started thee quilting. He took it in to school to show the teacher, and then I put it away. I had done all the stitch in the ditch around the colours, but it made the quilt all wavy. It needed more quilting, but I wasn't ready for the challenge. I found the quilt again this past week, and decided the time was right to finish it. So, back to Leah Day's website, The Free Motion Quilting Project for some ideas. This second photo shows that some of the black sashing has now been re-stitched with an all over design. You can clearly see the stitching in this photo. All the black is now stitched and the outside edges of the quilt are much less wavy. 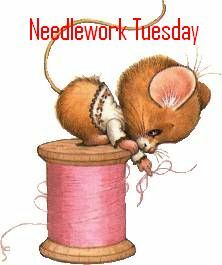 Next I am going to work colour by colour using a different pattern stitch for each colours areas. I hope to have an update on this next week. Each time I start a project, I really do intend to see it through to the end, but sometimes, I find that either I loose interest, something else comes along that's more interesting, or that I have reached a technique challenge that I am not up to at the moment. This was one of those situations. I now feel that I am at a better skill level that will allow me to finish this project and be happy with the results. I could have finished it before, but I don't think I would have been happy with it. What do you do when you reach a technique challenge? Tami, at Just One More Thing, knows exactly what I am talking about. 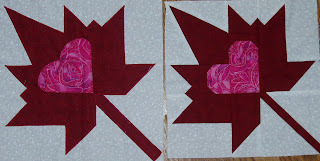 This week she features the sample blocks that she pieced. Marie, at Daisy's Book Journal, has posted some of her first Zentangles. Way to go Marie. 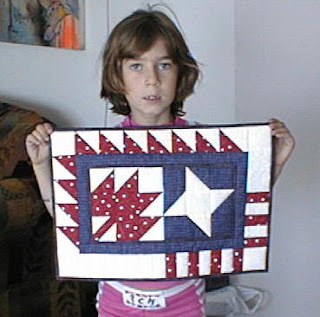 Over at the Quilting Galley, the show and tell are Patriotic Quilts from around the world. 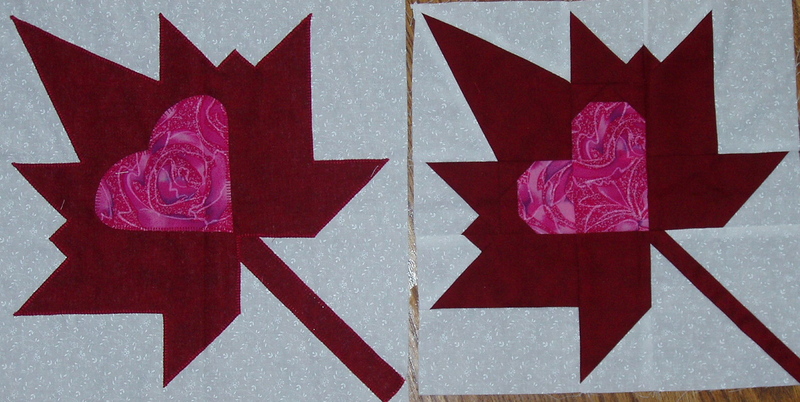 I have submitted my 'O Canada' quilt that I showed you earlier in the week. There are more than 20 other wonderful and moving quilts on display. Please visit there and view these patriotic pieces of art and then vote for up to 3 of your favourites. If you want, vote for mine, but go ahead and vote for those that you love the most. After you vote, be sure to leave a comment there at Quilting Gallery telling whether you have started your Christmas quilt projects (if you are a quilter or your other projects) to be entered to win a cookbook. Remember , these are patriotic from around the world. 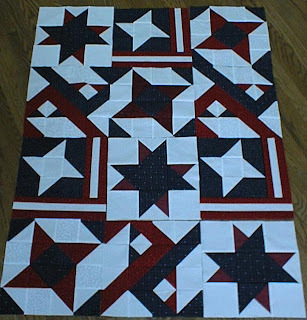 Some of my attempts at Patriotic Quilts. I designed this in response to the attacks on American on September 11. I made these blocks and sent them to a charity in New York that was making comfort quilts for the families of the victims of the World Trade Center disaster.